Being able to park your car up safely and efficiently is an absolute MUST if you’re using the roads in Derby regularly. It can be embarrassing and frustrating for those who lack in skill with this particular subject. When learning to drive, many driving schools fail to prepare learner drivers for what lies ahead of them after they pass their driving tests. Let’s break it down, when it comes to parking there are three key points that need to be addressed. They are as follows – control, observation, and accuracy. All three points need to be managed effectively if the manoeuvre is to be successful. The first thing to consider is how you are managing your speed. Have you adapted to the particular gradient that you are working with (up hill/down hill/flat). If the speed is to fast then your eyes don’t stand a chance in identifying your reference points and sending the appropriate messages to your hands and feet in time. Safety is also compromised as there isn’t time to keep tabs on what’s going on around the car or travelling in your direction. It may sound very simple for some people it is easier said than done. 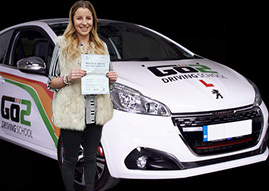 Maybe you live or are moving to a terraced street, maybe you struggle with day to day parking around Derby or maybe it’s parking up effectively in a bay when shopping, Go2 Driving School can help you gain confidence and skill in parking. If you know someone who is terrible at parking (we all do don’t we!) or the subject of a standing joke, then parking lessons in Derby with Go2 Driving school is the answer. Gift vouchers can be sent to you or someone else following your purchase. A 2-hour parking masterclass costs £56. To get confident parking your car in Derby, please purchase driving lessons online, then let us know that you’d like parking lessons when you book. Alternatively, you can call us on 01332 492 302.